The Chemical Guys Green Workhorse XL Microfiber Towel is the perfect tool for buffing and drying large vehicles. The extra large towel is made with super soft 70/30 blend microfiber for scratch-free wiping on paint, carbon fiber, and fiberglass body panels. The premium 70/30 blend stays soft through dozens of wash and dry cycles, and resists scratches on sensitive surfaces. 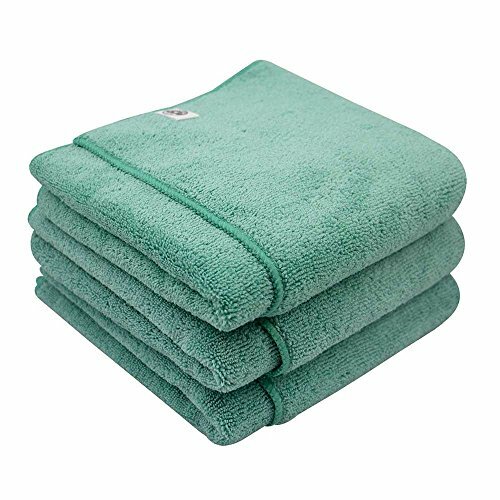 The large 24'' x 16'' towel easily folds into fours for efficient use of every inch of the cloth. Green Workhorse Towels pick up and trap dirt and debris, and easily remove any premium Chemical Guys wax, detail spray, or sealant. Choose the Workhorse XL towel to clean and dry large trucks, minivans, and SUVs after a weekly wash or for quick detail spray wipe downs. Remove contamination from paint and carbon fiber body panels to reveal a lustrous shiny surface. The ultra-absorbent towels trap liquids and solids like dirt and dust deep inside the fibers and away from sensitive paint on vehicle exteriors. This insulating action helps prevent dreaded swirls and scratches caused by improper washing and drying. For smaller more nimble jobs, try the versatile 16'' x 16'' size Workhorse Microfiber Towels to detail around any vehicle. Choose Green Workhorse XL Microfiber Towels to dry the car after a wash, use a waterless wash, pick up light dust and dirt with a detail spray, or buff away cured paste waxes and cream glazes. Unger Professional Stainless Steel Heavy-Duty Squeegee, 16"